Conventional wisdom holds that parasites, given enough time, will evolve to be harmless, because they depend on their hosts for survival. However, virulence may evolve as an unavoidable consequence of natural selection on parasite transmission. This hypothesis is based on the idea that parasites increase their fitness by transmitting to new hosts, and that this transmission results in unavoidable harm to the host. We have used the protozoan parasite Ophryocystis elektroscirrha, which infects monarch butterflies (Danaus plexippus) in natural populations. 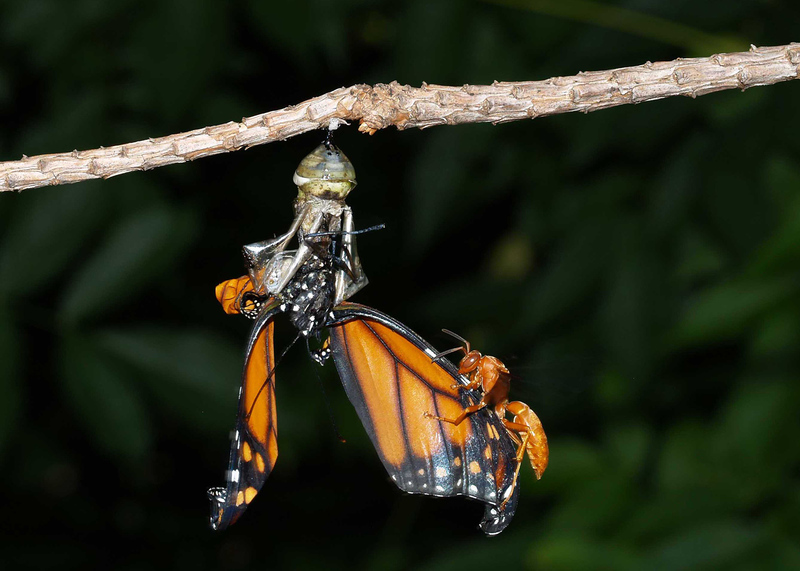 This parasite infects monarch butterflies at the larval stage, when caterpillars ingest parasite spores that are deposited by adult butterflies on the milkweed plants that these caterpillars eat. Parasites replicate to large numbers in the monarch caterpillar, such that adult butterflies can carry millions of parasite spores. Our work has shown that large numbers of parasite spores increase parasite transmission. However, parasite growth is also detrimental to the monarch, and monarchs that carry large numbers of spores are more likely to die before the adult stage, and mate less well and live shorter as adults. This work showed that parasite fitness is greatest at intermediate numbers of parasite spores, suggesting that parasite virulence may indeed evolve as a consequence of selection on parasite transmission: by selecting for parasites that can transmit between hosts, nature selects for parasites that cause disease to their hosts. Why are parasites harmful to their hosts? What are the relative costs and benefits of parasite replication? What ecological factors select for higher and lower virulence? Monarchs that are heavily infected with the protozoan parasite Ophryocystis elektroscirrha can become stuck in their pupal cases. In this case a paper wasp is taking advantage of the situation, collecting the monarch as food for its nest mates. Most theoretical models on parasite virulence evolution assume that host populations are homogeneous. In reality, however, host populations are spatially structured, and consist of hosts that vary in their resistance to parasite infection. We are collaborating with Levi Morran to study the effects of spatial structure and host genetic heterogeneity on virulence evolution, using Caenorhabditis elegans worms and their microsporidian and bacterial pathogens. This system is ideal because C. elegans has very short generation time, allowing experimental evolution in the lab. Does increased spatial structure result in the evolution of lower virulence? And does greater host population mixing result in selection for higher virulence? Do genetically heterogeneous host populations select for polymorphic pathogen populations or for single pathogens with lower virulence? 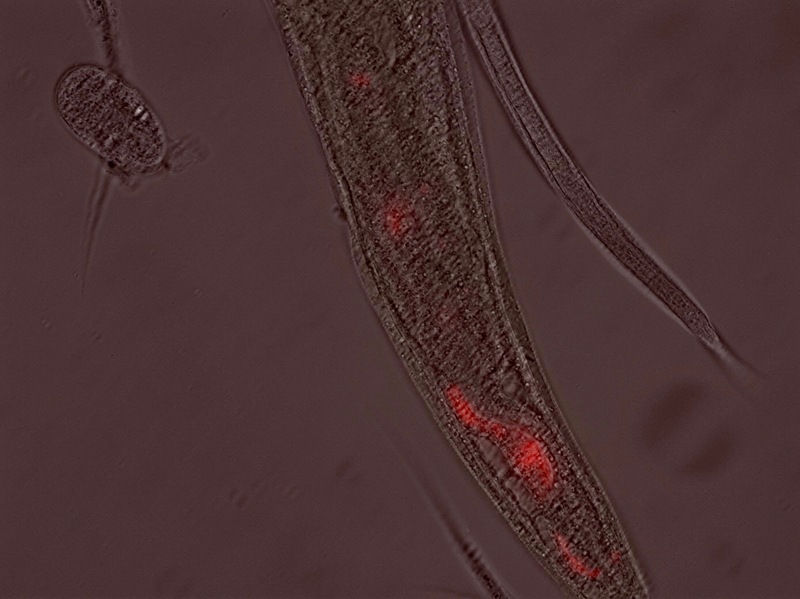 Microsporidian parasites infect the worm gut.